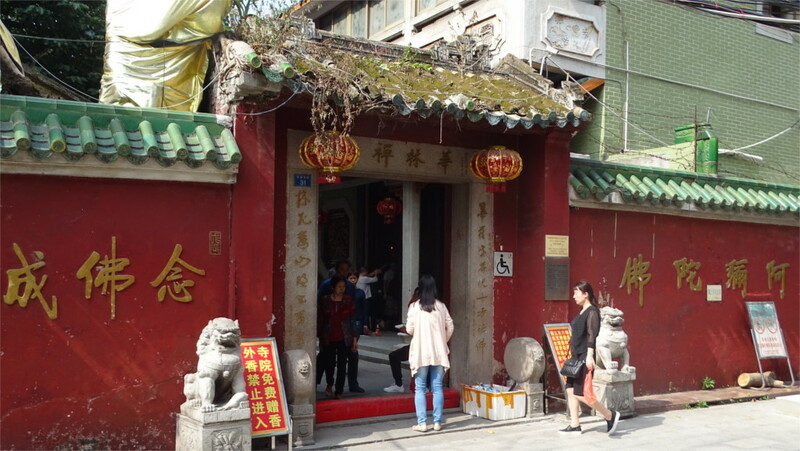 I stood at the intersection between the Shang Xia Jiu pedestrian street and the Kangwang South Road in Guangzhou without knowing that I was at the place which is traditionally accepted as the point where the monk Bodhidharma first stepped on Chinese soil. This was the door through which Buddhism entered China. I wouldn’t have been able to read the full text (Xilai gu an = come-from-west ancient landing-place) even if I had known that there was a commemorative stone here. 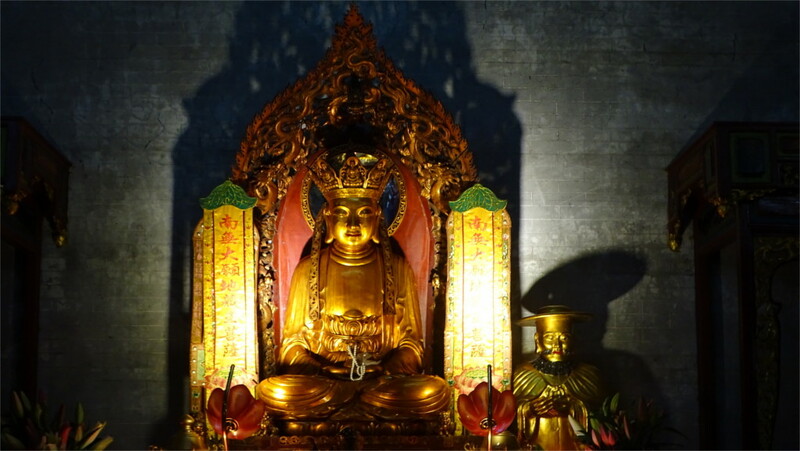 The nearby Hualin (Flourishing grove) temple which I had visited a few days earlier was called the Xilai (Coming from the West) temple when it was founded in 526 CE, about three hundred years after the arrival of Bodhidharma. The modern name was given in 1654 CE when the temple was expanded. It had taken us a while to find the temple. I’d followed what I thought was a well-marked road on the map. But the map was not accurate enough, and The Family and I wandered around narrow residential roads for a while before we found a well-dressed lady who directed us to follow her. Trailing in her wake, we walked through the Hualin jade market and reached the gate of the temple. The building inside was definitely modern. It didn’t take too much of a search to find references to the 20th century history of the temple. A part of it was sold off to create housing during the Republican period. All the statues were destroyed during the Cultural Revolution, and were remade in the 1990s when the temple reopened. Today the crowds are back. A monk handed us incense sticks as soon as we entered past the two immense dwarpalas who guard the door. Although we are not believers, we took the sticks, lit them and stuck them into the large brazier in the middle of the courtyard. One is polite to one’s hosts. Guidebooks do not mention the fact that the temple is newly reconstructed. Looking at the crowds streaming in, you would not believe that the tradition of going to temples had been interrupted for more than a decade. The tradition of exchanging money for luck is much more easily visible in China than anywhere else in Asia. I was getting ready to take a photo of the lion with money stuffed into its mouth when the gentleman you see in the photo above came by to complete the picture. The tall metal urn in the courtyard, which you see in the companion photo above, is full of coins. You toss coins into it for luck. Young and old vie to toss coins into the upper level of the urn, presumably you gain credit by doing that. We entered the hall of the 500 arhats. Temples in China are bustling and cheerful places. The first view was quite stunning, with long cases full of statues of the arhats and the central aisle dominated by the usual Chinese Buddha. For me this is always a little disconcerting: to find representations of an ascetic who preached an end to existence as the ultimate spiritual aim converted into a delighted gourmand. But why not? The Buddha ate kheer after enlightenment. The paintings on the ceiling seemed to have been done on paper and then mounted on the masonry. They were as interesting, and possibly as modern, as the statues in the hall. An unexpected sight was of the Emperor Ashoka being worshipped in a temple. Ashoka’s lion pillar is a symbol of the Indian state today; identity cards of government functionaries will have this seal on them. In China the lion pillar is a symbol of the Buddhist religion. Ashoka was responsible for the spread of Buddhism through Asia, so it makes sense that he should be held in some esteem. Borrowing from Taoist practices, I suppose he can become a Buddhist god. In any case, this explained why some monks asked me where I was from, and on figuring out that I was Yinduren, remained alert and helpful during the time I spent here. One corner of the temple was set up with tables and many older men and women sat there eating. I wonder whether this is common, or something that happens on special days. The previous night was Diwali, and often temple festivals are tied to the phases of the moon. So I could not rule out a special event. This twenty-armed goddess stood in a nearby altar. I still haven’t figured out what role she plays in the pantheon. One of the interesting things about this temple is that one of the arhats is supposed to represent Marco Polo. That’s the one you see in the round hat in the photo above. Since this is just folk belief, I hesitated to ask a monk. The Family cut short my search by taking the bold step of asking one of our friendly monks about this statue, and he led us there. Marco Polo was so taken up by Guangzhou, and gave it such glowing reports, that I’m not surprised that local sentiment favours him. 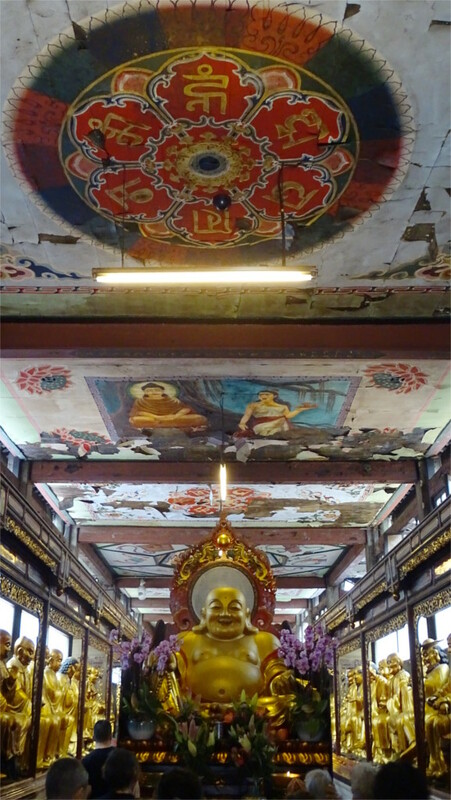 The most wonderful thing about this place are the 500 arhats. 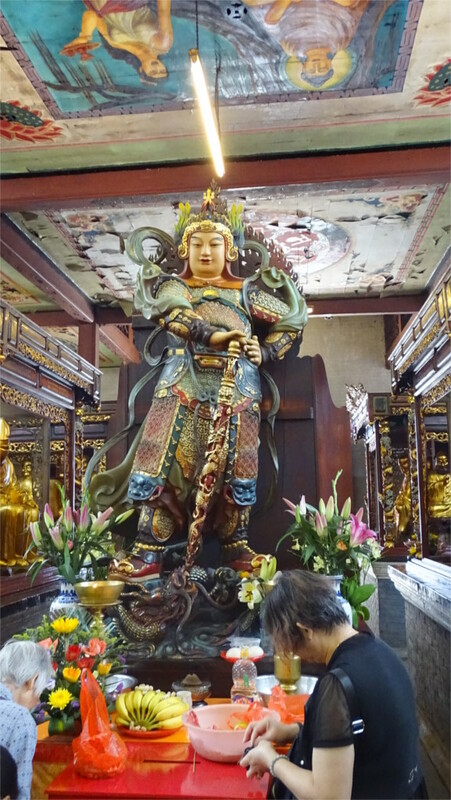 We wandered through the aisles of these larger-than-life statues, occasionally getting a little instruction from a monk in some special aspect of one or the other. I was a little surprised at finding arhats here. 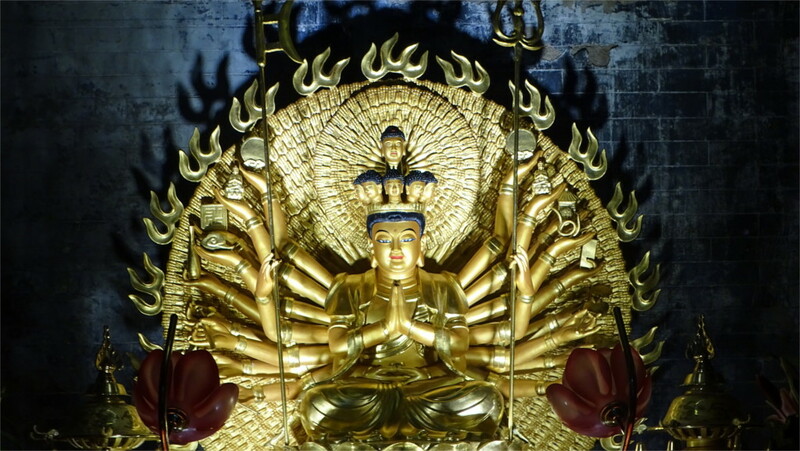 Theravada Buddhism holds that the highest level of attainment that a person can have is an arhat, whereas Mahayana Buddhism, prevalent in China, holds that every person should aim to attain the state of a Bodhisattva. This is one of the main doctrinal differences between these two schools. Bodhidharma founded Zen Buddhism, which is a part of Mahayana tradition. So finding arhats in this temple is strange. I was happy to take photos anyway, even knowing that these statues are considerably younger than me. We realized that we’d spent a long while here, and it was time to see the rest of the temple complex. Culture takes longer to change, it would seem. This is so clear in the new China. Your trip photos have shown me that. I’m glad. When I came back I looked for all the old photos of China before 1940 I could find so I could see it before. It changes every time I go. Yes, amazing. A very informative and interesting post. China is a fascinating country with a fascinating history.